I love it when the blogosphere introduces me to new people. That happened recently and my new friend's name is Jean Gralley. Jean's bio says that she "writes and illustrates picture books and believes their future is in motion." I have to admit that I don't spend much time thinking about children's books when I wonder about the future of publishing but it's great to know that people like Jean do. Jean is working on an initiative she calls Books Unbound. If you'd like to know what Books Unbound is all about, be sure to take a couple of minutes and watch this video. You won't be disappointed. She also wrote an article about her vision called Liftoff: When Books Leave the Page. When I watched her video and read her article I immediately wondered how much flak she's taking on all this. After all, we want to encourage kids to read, not spend even more time in front of yet another electronic device, right? She mentioned that she does indeed hear her share of grumbles and that "a librarian who heard me speak once blogged that she liked my books well enough to buy multiple copies for her library but Books Unbound made her want to rip them all up!" My opinion is that I'd rather have a child reading, period, and I don't care whether it's content in print or on screen. If there are ways people like Jean can integrate that content with other forms of entertainment, great, especially if it results in more kids reading. If you agree or if you've got feedback for Jean, please be sure to visit her website and hook up with her as well. Although my reading habits have shifted dramatically over the past couple of years, opting for RSS feeds over print magazines, I just discovered a new magazine that's worth a closer look. It's appropriately called Good, and based on the issue I just read, I think they could have also called it Great. I just finished their "High Tech/Low Tech" issue and found more interesting articles in this one magazine than I typically find in a handful of others. Think Wired without all the annoying artwork and gratuitous neon ink. That's right. It's full of...wait for it...great content! New issues come out every other month and a one-year subscription is $20. And get this... Every penny of your $20 subscription goes to one of 12 different nonprofit organizations that have partnered with Good. The list includes Room to Read, Teach for America and several others. I just signed up for a subscription and selected Kiva as my nonprofit recipient. 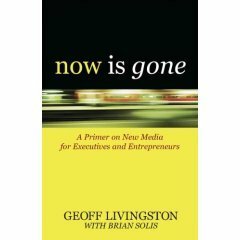 The subtitle for Now Is Gone is "A Primer on New Media for Executives and Entrepreneurs" and I think that very accurately sums up this book's focus and target audience. In short, anyone who wants to leverage new media in their business is going to find value in this book. It's easy to look at a failed social media initiative and point to one or more of these items as the reason the project collapsed. Some organizations stick by old media rules and insist on controlling the message themselves (#1), others take a "if you build it, they will come" approach and don't bother becoming active community members (#2), etc. "I have a hunch that the years ahead will be very exciting from a creative standpoint, as well as from a media view," said Kipp Monroe. "Creative content that does resonate with the culture and cuts through will be in big demand. Call it an online renaissance. I can't wait to see how what we call advertising will look 20 years from now." Build value for the community. This is a strategic principle. When you are looking to "market," know your community. It is only by listening, reading, and understanding that community that you can serve it with valuable information. Building value for a group of people means making a core decision to create content for them regardless of the technology or social network. Brian Oberkirch offers this valuable insight for his fellow bloggers: Focus on building the tribe one person at a time. Forget the Technorati 100 thinking. Being famous to 15 people is a huge advantage if they are the right 15 people. Now Is Gone features a great companion website where the story continues in blog format. It's also an excellent way to communicate directly with the authors. This book is filled with solid insight and is a must read for anyone who needs a quick lesson in new media capabilities and tactics. Every week I seem to stumble across a new blog that I'd like to catch up on. The tricky part is finding the time and grabbing the content in a manner that's portable and conveniently readable. Printing is an option but you're pretty much limited to the formatting capabilities of your browser. Earlier today I found another solution called Blog2Print. It's far from perfect but represents an interesting start in the right direction. It does what its name says...it converts your blog into a printed book. Pricing is prohibitively high though, IMHO, as it costs $29.95 for hardcover and $24.95 for softcover. I'm looking for the convenience of offline reading, not a coffee table book, so I can't think of a single blog that's worth this much to me. Blog2Print probably ought to consider other options that produce PDFs a customer can print on their own as well, and at a much lower price point (or funded through advertising). I'd also like to see them add more customization options. For example, you should be able to include post headlines as table of contents entries. If you're interested in seeing what Blog2Print's finished product looks like, go to this link and give it a try. Just enter your blog's URL and check out the results. Oh, btw, Blog2Print is currently limited to Google's Blogger platform only, so if you don't use Blogger you're out of luck...for now. Regardless, you can still see how it works by plugging in the URL of anyone else's Blogger-hosted blog. The cover shown with this post is not a joke. It's a real book entitled The Truth About Chuck Norris: 400 Facts About the World's Greatest Human. I hadn't heard about this one till I read this news story from Reuters today. Thinking it was a novelty title few people had heard about, I looked it up on Amazon and was stunned to see it is currently ranked #86 for all books! 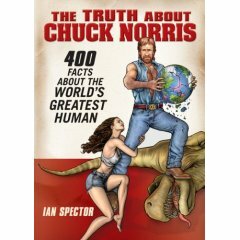 Walker, Texas Ranger only exists in the land of reruns but the world is apparently infatuated with "mythical facts" about the show's star. I could see this working as a website or an article in Mad magazine, but a book?! All year long we've been hearing that fewer and fewer adults are reading books. Shouldn't we be equally disturbed that one like this is doing so well? I love sarcasm and humor as much as the next guy, but who's buying this crap?! P.S. -- I guess I shouldn't be too surprised. After all, I see The Secret is still in the top 25 on Amazon! Wow. P.T. Barnum was right.